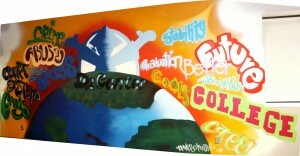 We’re thrilled to unveil the new mural in our classroom / conference room! Packasso Project students came up with the concept: negative factors, represented in darker colors on the left, passing through the D2 Center in the middle into brighter, more positive thoughts on the right, including graduation, college and careers. Thank you, Packasso Project students! Also special thanks to the D2 Center’s Albert Varas who coordinated the project – and even did a bit of spray-painting himself. Packasso Project was born in an attempt to redirect the artistic abilities of graffiti artists at Omaha South High Magnet School that were using the wrong canvas to express themselves. In Packasso, they have the opportunity to develop their art and, at the same time, work in their academic and living skills. For more than two years these young artists have improved their high school performance (some of them have graduated already), presented at local and national conferences, painted murals all over Omaha, and exhibited and sold their artwork in several galleries. Students are selected to be part of this project based on their artistic talents and the skills they can contribute to the group. Most members of the group have a record for doing illegal graffiti in addition to other personal issues. Learn more about the Packasso Project by liking their Facebook page.